You may not know this, but Korea and Japan has a territorial dispute between an island called Dokdo. In order to solve the dispute, scholars from both countries need to share the truth and toil to find a solution. However, the Japanese scholars are refusing to participate in a debate. This is because Korea has superiority when it comes to historical, international data. For example, Takeshima Day has been held every year since 2006 on Feb. 22, in order to celebrate the 100th anniversary of Shimane Prefecture's incorporation of Dokdo as Japanese territory. Japan incorporated the island into Shimane Prefecture in order to use the island as a strategic location during the Russo-Japanese war. However, prior to 1905, Dokdo is shown as Korean territory on Japanese maps. Japan forcefully took Dokdo when they occupied Korea. If Koreas really have solid historical, international data then why does not they just go to the International Court of Justice rather than doing silly protests such as chopping their fingers, cutting the heads of pigs and throwing dead pheasants over the Japanese embassy wall? 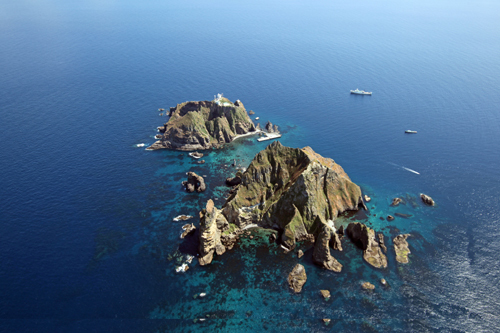 "As regards the island of Dokdo, otherwise known as Takeshima or Liancourt Rocks, this normally uninhabited rock formation was according to our information never treated as part of Korea and, since about 1905, has been under the jurisdiction of the Oki Islands Branch Office of Shimane Prefecture of Japan. The island does not appear to ever before to have been claimed by Korea." Upon receiving the letter from Additional State Secretary Mr. Dean Rusk and realizing that the US will not give Takeshima to Korea, President Lee Seung-Man announced the Lee Line on Jan. 18, 1952 and took Takeshima by military force. Since then, over 20 Japanese fishermen have been killed, and nearly 4,000 captured by the Korean navy. The captured fishermen were not returned to Japan until 1965, when the Japan-Korea Treaty was concluded. Under normal circumstances, such an action would have meant war. But Lee Seung-Man knew very well that Japan was tied down by the pacifist constitution given to it by the the US and that Japan could only file complaints against the Korean government. Also Japan and Korea exchanged an instrument of ratification of the new Japan-Korea Fisheries Agreement, which entered into force in January, 1999. In the agreement, the two countries agreed to the establishment of “provisional common waters” around Takeshima/Dokdo without prejudice to the title to the island. Since then, however, Japanese fishing boats have still been shut out of the fishing grounds in the area. The local fishermen in Shimane Prefecture became increasingly impatient and discontented with this situation. Such situation led Shimane Prefecture to the announcement of Takeshima Day. How can Koreans complain about Japan when it’s the Korean government that is ignoring the agreement? It seems like Koreans just don’t have the respect for the treaty that most civilized countries/people do. It is not a rational thinking going on there. Extreme nationalism and favoritism that hurts objective thinking, extremely specific way of thinking and doing things that rather relies on feelings and intuition than on in depth knowledge and analysis…It’s no wonder that none of Koreans has ever won any significant international prize in science, medicine, writing, etc. No one else in the world really cares or gets what the fuss is all about. Basically Japan has only four neighbors and have territory disputes with all of them. China (and Taiwan) is relatively soft in this situation but is becoming tougher. Each country has multiple disputes. China seems to have the most out of the 4. Last edited by Momotaro; 02-20-2013 at 05:57 PM..